Transcript: The new Intimus Data Shredder generation – energy efficient, user-friendly, environmentally sound. Developed and designed in Germany based on fifty years of Intimus shredder know-how. A successful synthesis of power, technology and design. Eye control – The heart of the new technical concept. Ensures unprecedented clarity of operator guidance. Ergonomically designed function keys – Its legible, illuminated symbols inform about overload protection, activated interlock, catch basket full, catch basket not in place, service advice lubricant cutter and paper jam. 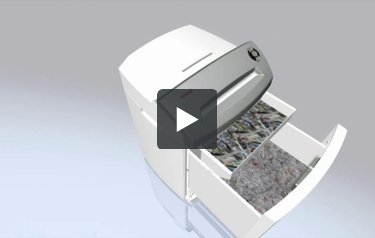 The new Intimus Data Shredder generation – energy efficient, user-friendly, environmentally sound. Developed and designed in Germany based on fifty years of Intimus shredder know-how. A successful synthesis of power, technology and design. Environmentally sound solution – Discrete cutters and catch baskets for paper and other materials. Energy efficient – Automatic switching to sleep mode, thus, avoiding unnecessary power consumption in standby mode and reducing energy consumption to a minimum. Access protection – A new user authorization function, for instance, to avoid activation by children in the home office. Dynamic load sensor – No interruption of shredding when overloaded. The traffic light logic keeps the user informed. The new models, new standards in design, technology and performance. A trendsetting generation in data protection.